After two months writing this blog I’ve decided it’s time that I featured a recipe for a dessert, and I’m basing this one on a traditional allotment stalwart. 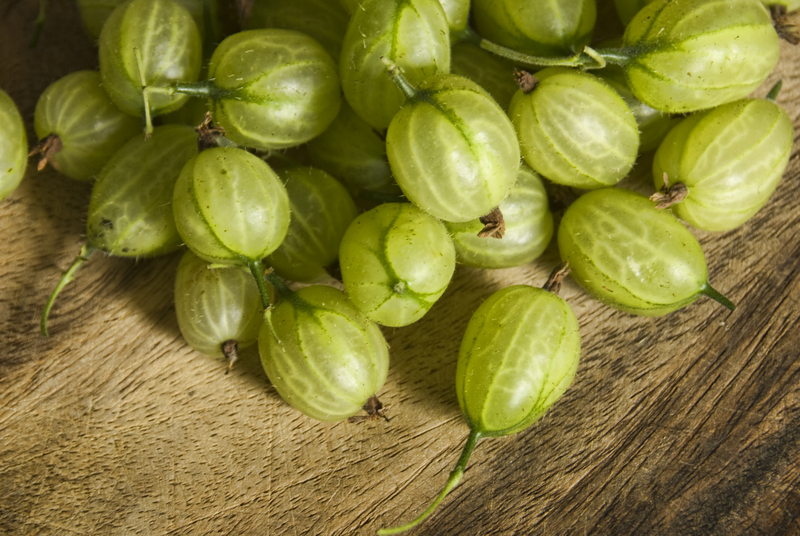 Is there a fruit more quintessentially British than the gooseberry? 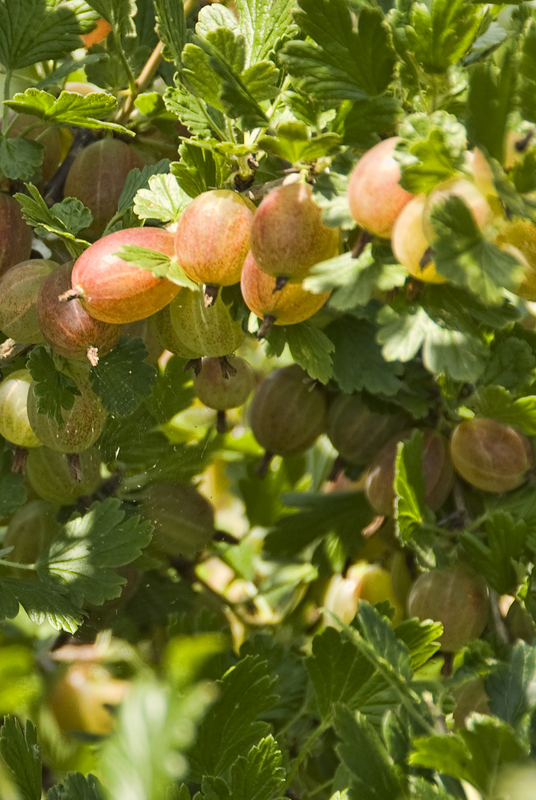 It is perfectly suited to our temperate climate and, just a few generations back was so revered that “gooseberry shows” proliferated across the Midlands and North of England. But then the supermarkets began to get a subtle but increasingly inflexible grip over the way we “choose” and buy our fruit. Nowadays, even during the height of the gooseberry season it is becoming increasingly rare to find them showing up for sale in supermarkets, where they have been edged out by fruit which has a dependable, year round source of supply – strawberries imported from Spain, raspberries from South Africa and blueberries from Chile. This “fresh” fruit selection flown in from around the globe is one of many indicators that something is badly skewed in the way supermarket-sold fruit is screened, sourced and presented to us. Traditional, seasonal fruits are inconvenient when your priority, as is the case with our supermarkets, is to have a steady conveyor belt supply of the same fruit, week in, week out. It means that it is increasingly down to allotment holders and home growers to keep this wonderful and unfairly overlooked fruit going. There are a wide variety of gooseberries in existence. I grow one called Pax, a red dessert gooseberry which is so perfectly sweet when ripe that you can eat it straight from the bush without the slightest hint of an involuntary shudder or puckering of the lips. However, I’m not using my sweet Pax gooseberries in this recipe simply because it’s a variety that is virtually impossible to source unless you happen to grow your own. If you don’t grow any gooseberries at all then farmers markets and farm shops are likely to be your best bet for sourcing them. And if you are one of those people who believe they don’t even like gooseberries, give this recipe a try. If the reaction of the erstwhile gooseberry haters in my own family is anything to go by, this will change your mind. The recipe, at its heart, depends upon the classic synergic combination of gooseberries and elderflower, coming together here in a delightful, light, summer ice cream. It doesn’t require an ice cream maker, relying instead on careful preparation and chilling of each component and the incorporation of plenty of air into the final ensemble. 2. First, make the crumble. Place the flour, caster sugar and butter in a mixing bowl or food processor and combine thoroughly until the mixture resembles breadcrumbs. Add the ground almonds and mix thoroughly. Tip the mixture onto a baking sheet and place in the pre-heated oven for around 15 minutes until golden brown. It’s a good idea to check the crumble mixture every so often to ensure it does not burn. 3. Remove the crumble from the oven and set aside to cool completely. Then pour the crumble into a ziplock bag or plastic container with a lid and place in the freezer. The reason for freezing the crumble is to ensure that it remains crispy, rather than soggy, in the finished ice cream. 4. Next, make the elderflower caramel. Place the water and sugar in a pan and bring to the boil over a medium heat, stirring to dissolve the sugar. When the sugar has dissolved, increase the heat under the pan but stop stirring and watch carefully until the mixture turns a rich amber in colour. Remove from the heat and carefully pour in the double cream, stirring or whisking as you do, but being mindful of the fact the hot syrup may “spit” when it comes into contact with the cold cream. If the resultant mixture becomes lumpy, just reheat it on a gentle heat, whisking or stirring and it will become smooth again. Finally add the elderflower cordial, mix thoroughly and set aside to cool. When it has cooled completely, place the caramel in the fridge. 5. Now for the gooseberry compote. Wash, top and tail the gooseberries and place them in a pan with the sugar on a very low heat. Cover the pan and leave to cook until the gooseberries are soft, stirring every so often. This will take around 20 minutes. Use a spoon to flatten any gooseberries that have not burst. Add the elderflower cordial and mix thoroughly, then leave to cool before placing in the fridge. 6. Now to bring all the components together. Whisk the egg whites until they are just starting to form soft peaks. Sprinkle the icing sugar over them and whisk again until meringue-like glossy peaks are formed. In separate bowl whisk the cream until it forms soft peaks. 7. Fold the gooseberry compote into the whipped cream and stir carefully. Next add the egg whites, again folding very carefully (you want to retain as much air in the mixture as possible). Next tip the frozen crumble on top and pour on the caramel. Gently fold these into the mixture, using no more than three or four turns as we don’t want a homogenised mixture but an ice cream with rippled caramel and crumble delights. 8. Pour the mixture into a suitable freezer carton and freeze. You will need to take it out of the freezer around 15-20 minutes before you intend to serve it.